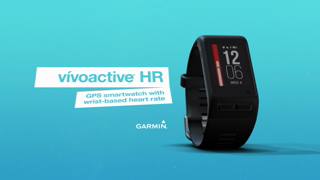 Get active while using the Garmin Vivoactive HR GPS Smartwatch. It contains Elevate wrist heart rate technology that can be used while you run, bike, swim, golf, ski and much more. The Garmin smartwatch has a built-in activity tracker that counts steps throughout the day and measures calories burned. It features a sunlight-readable, high-resolution touchscreen with smart notification, such as call, text, email, social media alerts and more. The Vivoactive smartwatch can be customized with apps, watch-face designs, data fields and widgets from the Connect IQ store. The battery charge can last through all of your activities with up to seven days in activity tracking mode or up to 13 hours using GPS. Get active while using the Garmin Vivoactive HR GPS Smartwatch. It contains Elevate wrist heart rate technology that can be used while you run, bike, swim, golf, ski and much more. The Garmin smartwatch has a built-in activity tracker that counts steps throughout the day and measures calories burned. It features a sunlight-readable, high-resolution touchscreen with smart notification, such as call, text, email, social media alerts and more. The Vivoactive smartwatch can be customized with apps, watch-face designs, data fields and widgets from the Connect IQ store. The battery charge can last through all of your activities with up to seven days in activity tracking mode or up to 13 hours using GPS. It straps around your wrist and is lightweight. The design makes it very convenient so that it is easily accessible whenever you are ready to go full steam. The Garmin Vivoactive HR GPS Smartwatch is ideal for a person trying to lead an active, healthy and productive life. I definitely recommend this to anyone that bikes and runs and wants to record their progress. As you run you can monitor your pace and heart rate and provides very accurately how far you have run. Notifies you when you have been stagnant for too long. Predicts the calories you've burned during a workout and throughout the day. The app for it syncs with MyFitnessPal which makes recording calories and diet so much easier. You can read messages from your phone if you are within distance. The Walmart online purchase of the Garmin vivoactive was awesome. No issues during the checkout and easy to find all the information I was looking for the selection of the smartwatch that will satisfy the demand of my exercise routine! Five thumbs up for Walmart online purchasing web page. I was looking for a fitness watch that I could use everyday at work (needed a second hand counter), track my steps, etc and replace my current running watch. This watch does all of this and more! Easy to use with the touch screen. Very personalizable. The connect app has a ton of colorful information to analyze. It is a little big one my female wrist but never feels odd or cumbersome. Be careful not to delete an app like I did. I couldn't figure out how to get it back so I reset the watch to get it back. I've been using the watch for about 2 years, primarily for cycling, but have used for running and swimming. I utilize Strava interfaces to capture my statistics over time. The interface works well. While it does many things well, I have been disappointed with its tracking of elevations. I ride with friends using Garmin bike mount trackers. There is an alarming difference between their climb and decent tracking and my wearable. This need to be improved. Secondarily, I have noticed gaps in heart rate tracking, which may have been fixed with a software update, but this is speculation on my part. Again, for a broad set of options, this was the best I could find at the time. No regrets and nothing is perfect. I have certainly gotten my money out of this device.